In the present report, two techniques of space closure; two-step anterior teeth retraction (TSR) and en masse retraction (ER) were used in two adult patients who had bimaxillary protrusion and were treated with four premolar extractions and fixed orthodontic appliance therapy. Both patients had a Class I dental malocclusion and the same chief complaint, which is protrusive lips. Anterior teeth were retracted by two-step retraction; canine sliding followed by retraction of incisors with T-loop archwire in the first patient and by en masse retraction using Beta titanium alloy T-loop archwire in the second case. At the end of treatment, good balance and harmony of lips was achieved with maintenance of Class I relationships. The outcome of treatment was similar in the two patients with similar anchorage control. ER can be an acceptable alternative to the TSR during space closure since it is esthetically more acceptable. However, it requires accurate bending and positioning of the T-loop. This report describes two methods of anterior teeth retraction after premolar extraction (two-step and en masse) in two bimaxillary protrusion cases. 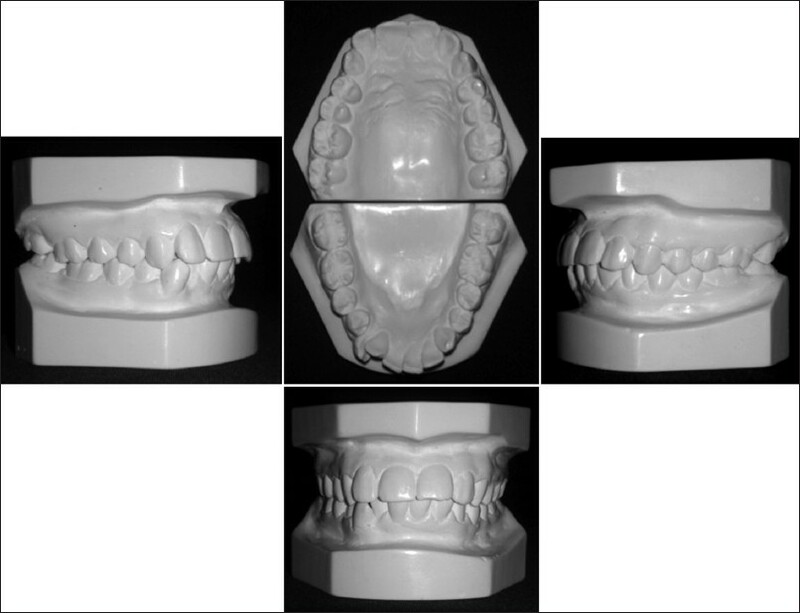 Complete pretreatment orthodontic records were taken including extra and intra oral photographs, orthodontic models, panoramic radiograph, periapical radiographs, lateral cephalogram. All records were analyzed and diagnosis was established. 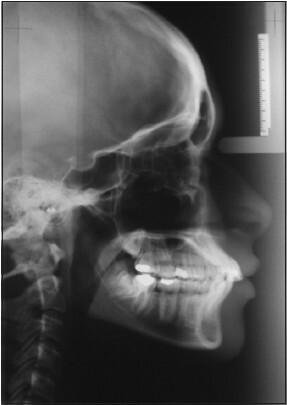 A 22-year-old male patient presented with the chief complaint of protruded lips and teeth. He had a mesofacial face type, convex profile, prominent nose and retruded chin. He had bimaxillary dentoalveolar protrusion with Class I molar and canine relationship on a skeletal Class II base, increased over-jet (5 mm) and mild crowding in the lower anterior teeth. 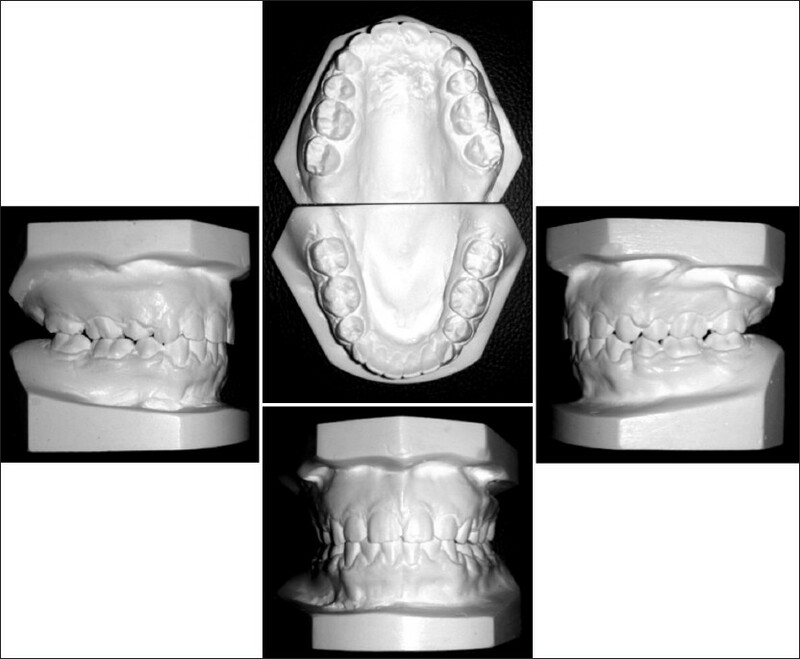 His lateral cephalometric radiograph reveals Class II skeletal relationship with hyper-divergent mandible, bimaxillary dental protrusion, retrognathic mandible and decreased lower facial height [Figure 1], [Figure 2], [Figure 3] and [Table 1]. A 22-year-old female patient complaining of protrusion of her anterior teeth with crowding in the lower teeth. She had bimaxillary dentoalveolar protrusion with Class I molar and canine relationship on a skeletal Class I base, increased over-jet (5 mm) and crowding in the lower arch approximately (5 mm) with maxillary tooth size excess (2.7 mm). 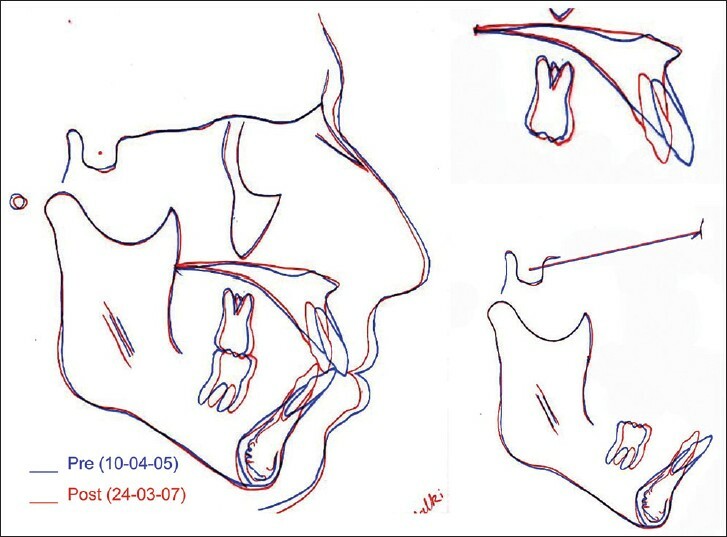 Her lateral cephalometric radiograph revealed a Class I skeletal relationship with hypodivergent mandible, bimaxillary dental protrusion, prominent chin and decreased lower facial height [Figure 4], [Figure 5], [Figure 6] and [Table 1]. The treatment plan involved extraction of all first premolars with maximum anchorage to resolve the protrusion in both cases. Treatment plan was presented to the two patients and consent forms were signed. 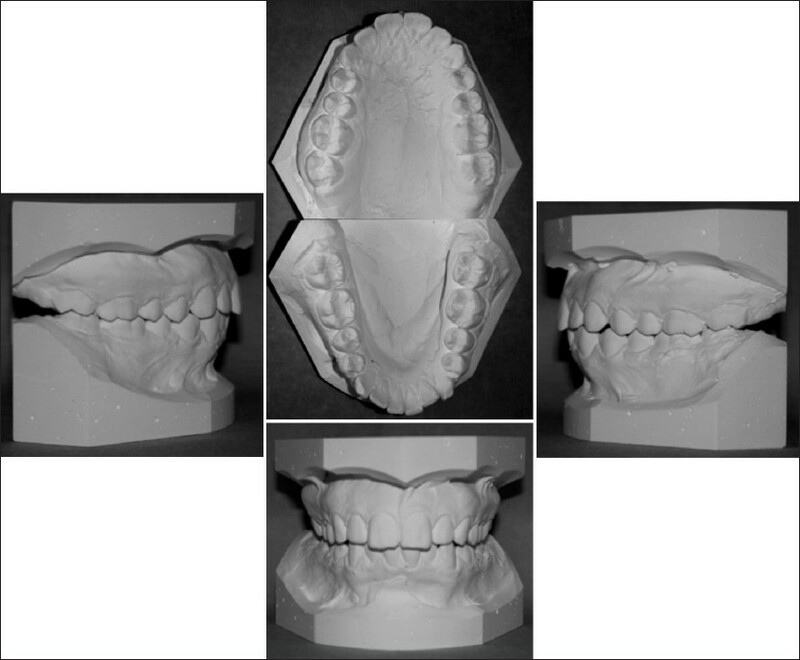 Comprehensive fixed orthodontic appliance therapy (0.018-inch brackets, 3M Unitek, Monrovia, Calif.) was used. For TSR plan, maximum anchorage was planned by retracting canines against the second premolars, first molars and second molars to increase the posterior anchorage unit, then retraction of the four incisors using 0.016 × 0.022-inch stainless steel T-loop archwire. For the ER plan, 0.017 × 0.025-inch TMA T-Loop archwire was used to retract all anterior teeth . Maximum anchorage was planned by increasing the β moment through the positioning of the T-loop closer to the posterior teeth (1/3 the distance between canine and first molar). Case one was treated by TSR plan and case two was treated by ER plan. After all first premolars extraction, bonding and banding of all teeth including permanent second molars were done, Nickel-Titanium archwires were used for leveling and alignment with gradual archwire upgrade from 0.014-inch to 0.016 × 0.022-inch [Figure 7] and [Figure 8]. In case 1 upper and lower canines were retracted on stainless steel archwires (0.016 × 0.016-inch) using elastomeric chain against second premolar, first and second molars as part of the maximum anchorage preparation, elastomeric chains were changed every 3 weeks. After canines' retraction was completed, incisors retraction was performed using T-loop stainless steel archwire (0.016 × 0.022-inch) with anterior step up, anterior lingual root torque and Gable bends. After closing all the spaces, finishing and detailing was performed [Figure 9], [Figure 10] and [Figure 11]a. Case 2: En masse retractions was achieved using T-loop (0.017 × 0.025-inch) TMA archwires with off-centered retraction loop, the T-loops were located close to the molars for maximum anchorage, about 1/3 the distance from canine to molar, bypassing the premolar brackets, inserted in the utility arch tube with stabilizing archwires from second premolar to second molar. The anterior and posterior legs of the T-loop were bent 45° to give the following expected movements; mesial roots movement and extrusion of molars and controlled distal crown tipping and intrusion of anterior teeth. Soldered trans palatal arch and base archwires (0.016 × 0.022-inch stainless steel) were used to stabilize buccal segments during the en mass retraction After closing spaces, finishing and detailing was done using 0.017 × 0.025-inch TMA archwires to ensure good lingual root torque of the retracted anterior teeth. 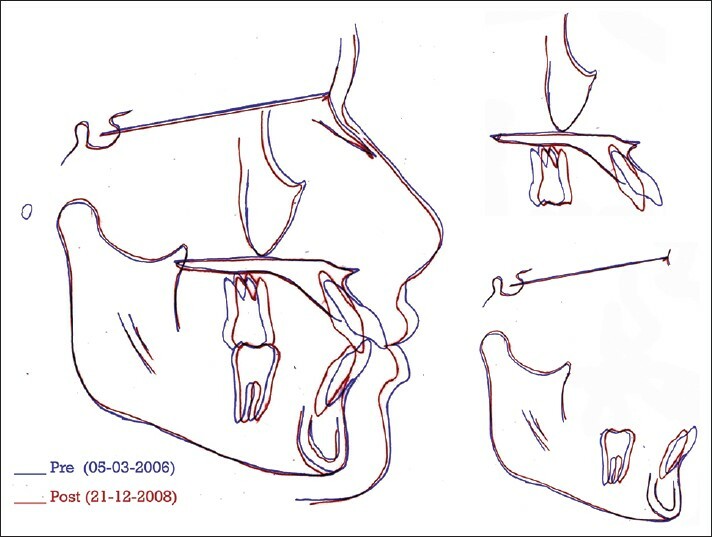 In addition, inter-proximal reduction of upper anterior teeth was performed to resolve the tooth mass discrepancy of the anterior teeth [Figure 11]b, [Figure 12] and [Figure 13]. Upper wrap around acrylic retainer and lower fixed retainer (17.5 mil braided Stainless steel wire) were used for retention in both cases. Final records taken at the end of treatment and were analyzed. Cephalometric superimposition was done using Bjork and Skieller method , to evaluate the amount of mesial movement of molars in both cases. The outcome of the treatment was similar in both patients, the bimaxillary protrusion was resolved, both cases were finished into Class I molar and canine relationship with normal overbite and over-jet, good balance and harmony of lips. The amount of anchorage loss was 2 mm in both cases except the upper molars in en masse group, which was 2.7 mm. 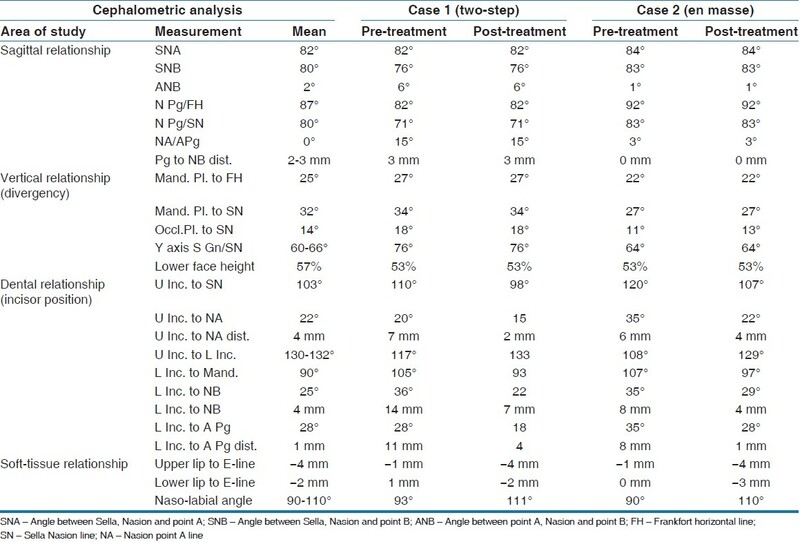 Treatment duration was the same in both cases [Figure 14], [Figure 15], [Figure 16], [Figure 17], [Figure 18], [Figure 19], [Figure 20], [Figure 21]. This report of two cases is considered as one of a few reports that compare two common intraoral methods of space closure during extraction treatment of Class I bimaxillary protrusion cases to provide maximum anchorage, which are TSR and ER of anterior teeth. Unlike the present report, Xu et al. evaluated the effectiveness of TSR and ER to provide maximum anchorage aided by headgear and trans-palatal bar in growing Class I and Class II patients in a randomized clinical trial. Still, a future randomized clinical trial is needed to compare the two methods in adults without any extraoral anchorage since headgear is difficult to use in adults. The amount of mesial movement of the upper and lower first molars in TSR case was 2 mm. Unlike the mesial displacement of lower first molars in the ER group (2.0 mm), the mesial displacement of upper first molars was about 2.7 mm. These values represent about 25% of extraction spaces which indicate the maintenance of maximum anchorage in both cases. , Unlike, the present report, Xu et al. reported that loss of anchorage was more in the TSR than in the ER group but the difference was insignificant. However, it is unfair to compare the present report with the study of Xu et al. since the sample used in the present report consisted of only two cases where the Xu et al. study was a randomized clinical trial. In addition, headgear was used as additional method of anchorage in the Xu et al. study, while in the present study, headgear was not used in both cases and maximum anchorage was largely maintained by intraoral methods. Therefore, randomized clinical trials are needed to confirm the findings of the present report. The amount of mesial displacement of molars reported here was less than that reported by Xu et al. although they used headgear extra-oral anchorage during incisor retraction in both groups, which depends largely on patients' compliance. In the present cases, however, anchorage was aided by adding second molars to the buccal segments in both groups. In the present report, the incisors were retracted by a combination of bodily and controlled tipping movement. Upper incisors in the TSR case showed more bodily movement than those in the ER case, in which controlled tipping was more obvious finding. This was beneficial and tailored to the ER case due to the presence of a pretreatment increased proclination of the upper incisors, which needed more controlled tipping than bodily movement. On the other hand, bodily movement of upper incisors was more indicated in the ER case, where upper incisors were protruded more than proclined. The T-loop retraction archwire in anterior teeth retraction can help in controlling the resultant inclination of incisors. , Based on this, it can be concluded that ER method can be more beneficial for the severely proclined upper incisors and if bodily movement is required, additional torqueing should be done during the finishing stages of treatment. Methods of providing anchorage were different between the two cases. In the ER case, maximum anchorage was maintained via applying a larger moment on the anchor teeth with a lesser one on the anterior teeth. Positioning the retraction T-loop toward posterior teeth in the en masse case produced an extrusive force and a greater moment on the posterior teeth. At the same time, it produced an intrusive force and a smaller moment on the anterior teeth, As a result, molars experienced extrusion and molars' roots moved mesially and anterior teeth tipped distally in a controlled manner. The outcome of this treatment coincides with the findings of Kuhlberg and Priebe who concluded that the force system of off-centered retraction T-looped archwire does predict the tooth movement response  In the TSR case, anchorage was maintained via retracting incisors in two stages and banding second molars. At the same time, the more bodily movement seen in this case was due to special bending in the T loop archwire, which included, anterior intrusion steps, lingual root torque of incisors and Gable bends of the posterior segments. Within the limitation of this report, the two methods of retraction described here showed similar outcome. However ER is an acceptable alternative to the TSR during space closure since it is esthetically more acceptable but it requires accurate bending and positioning of the T-loop. 1. Braun S, Sjursen RC Jr, Legan HL. On the management of extraction sites. 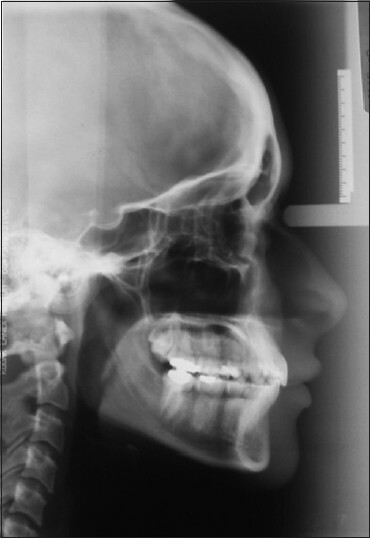 Am J Orthod Dentofacial Orthop 1997;112:645-55. 2. Proffit WR, Field HW Jr, Sarver DM. The biological basis of orthodontic therapy. In: Contemporary Orthodontics. 4 th ed. St. Louis: Mosby; 2007. p. 331-58. 3. Xu TM, Zhang X, Oh HS, Boyd RL, Korn EL, Baumrind S. Randomized clinical trial comparing control of maxillary anchorage with 2 retraction techniques. 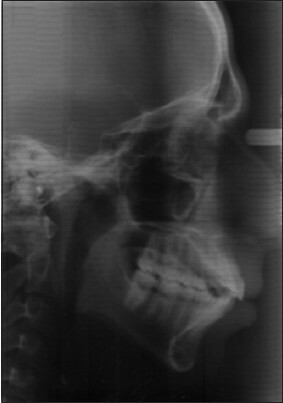 Am J Orthod Dentofacial Orthop 2010;138:544.e1-9. 4. Thiruvenkatachari B, Ammayappan P, Kandaswamy R. Comparison of rate of canine retraction with conventional molar anchorage and titanium implant anchorage. Am J Orthod Dentofacial Orthop 2008;134:30-5. 5. Burstone CJ. Rationale of the segmented arch. Am J Orthod 1962;48:805-22. 6. Burstone CJ. The mechanics of the segmented arch techniques. Angle Orthod 1966;36:99-120. 7. Burstone CJ. The segmented arch approach to space closure. Am J Orthod 1982;82:361-78. 8. Burstone CJ, Hanley KJ. Modern edgewise mechanics segmented arch technique. Farmington: University of Connecticut Health Center; 1985. 9. Kuhlberg AJ, Burstone CJ. T-loop position and anchorage control. Am J Orthod Dentofacial Orthop 1997;112:12-8. 10. Kuhlberg AJ, Priebe D. Testing force systems and biomechanics - Measured tooth movements from differential moment closing loops. Angle Orthod 2003;73:270-80. 13. Burstone CJ, Koenig HA. Optimizing anterior and canine retraction. Am J Orthod 1976;70:1-19. 14. Erverdia N and Acarb A. Zygomatic Anchorage for En Masse Retraction in the Treatment of Severe Class II Division 1. Angle Orthod. 2005;75:483-490. 15. Liou EJ, Chang PM. Apical root resorption in orthodontic patients with en-masse maxillary anterior retraction and intrusion with miniscrews. Am J Orthod Dentofacial Orthop 2010;137:207-12. 16. Nanda R. Biomechanics in Clinical Orthodontics. Philadelphia, Pa: WB Saunders; 1997. p. 156-61. 17. Heo W, Nahm DS, Baek SH. En masse retraction and two-step retraction of maxillary anterior teeth in adult Class I women. A comparison of anchorage loss. Angle Orthod 2007;77:973-8. 18. Juvvadi SR, Kailasam V, Padmanabhan S, Chitharanjan AB. 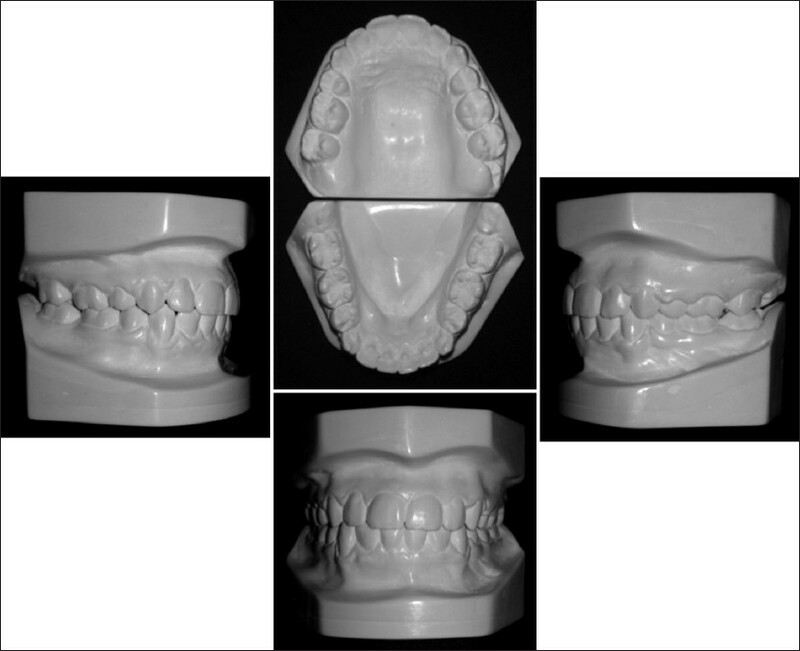 Physical, mechanical, and flexural properties of 3 orthodontic wires: An in-vitro study. 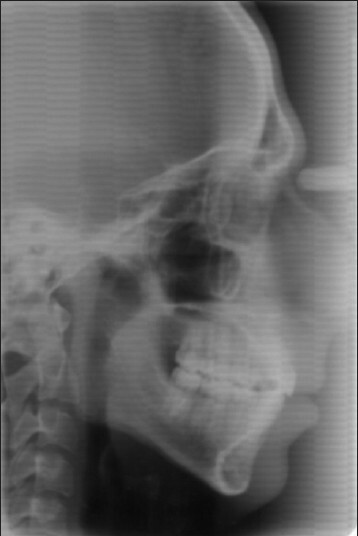 Am J Orthod Dentofacial Orthop 2010;138:623-30.